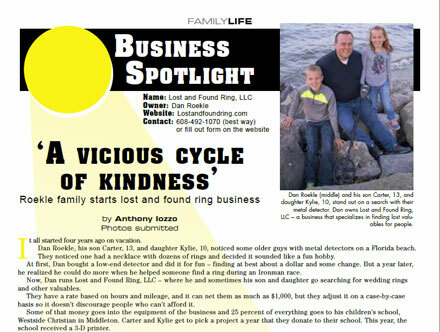 Lost and Found Ring was recently featured in Your Family Magazine, a publication of the Unified Newspaper Group Publications. The title of the article was “Vicious Cycle of Kindness” (page 34 is where our article can be found). Anthony Iozzo did a great job writing the article and performing the Q & A interview. The article does a great job detailing how we started metal detecting, and eventually turned it into a successful business. 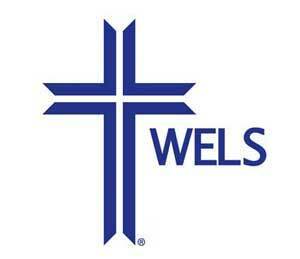 Your Family pointed out that we donate 25% of all rewards and fees to my kids school, Westside Christian in Middleton. I always say that I have the best business in the world. Finding lost rings is one of the most rewarding things I have ever done. What a blessing it is to be able to help people in need while doing something I love. Reward money stays in the business, allowing me to continue to upgrade my metal detector and other equipment. I also joke that I can buy a new toy without having to get my wife’s permission, because it’s a business expense. Find something you are truly passionate about, and you’ll never work another day in your life. I love my job and would do it every day if I could. Westside Christian is a great school, and I love being able to give back and help make it even better through our donations. Is there an organization you could help by donating your time or money? Do you know someone who lost a ring years ago? Have them give me a call. We have found rings lost more than 10 years ago. It really doesn’t matter how long ago it was, just so the person has a general idea of where they lost the ring. Our metal detectors can go very deep into the ground. Lost a ring in the water? We have found rings lost for 5, 7 and 9 years in the water.